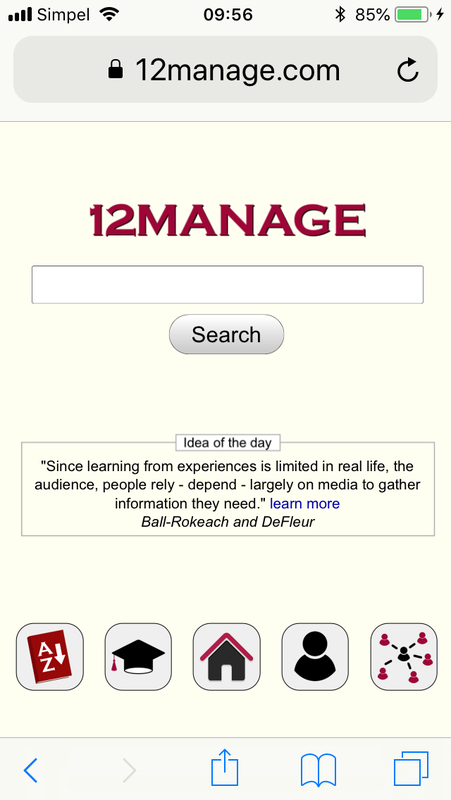 Be informed that a new feature has just been added to 12manage: the "Management Idea of the Day". This feature is part of the 12manage app and of our search page. It is meant to encourage you to learn something about management each day or at least on a regular basis. To make it easy to read the Management Idea of the Day, install our app. Our 'app' is 100% FREE, respects your privacy, is simple to install and does not require updates. Here you can install the 12manage app. Works on any PC, iPad, phones, etc. ⇒ What you think of the Management Idea of the Day (and our App)? I like this app by 12manage. Allows you to lookup any subject taught during your MBA. We improved 12manage on Phones. Take a look! Happy Management Learning in 2015!